As we were sat in Roussillon today, my hubby said ‘I really love just getting somewhere’ and to be honest I had to agree with him. Over the years we have spent time in cars just hopping from one attraction to another, fighting to get into parking spaces, taking a brief look at the sights, taking the ‘must-take’ photos and then moving onto the next ‘must-visit’ place. We now tend to spend our time cycling around the area, spending a whole day ‘getting’ to the places we want to visit and feeling a sense of achievement when we get there (particularly as many of the villages here seem to be at the top of a hill) and today was no exception. 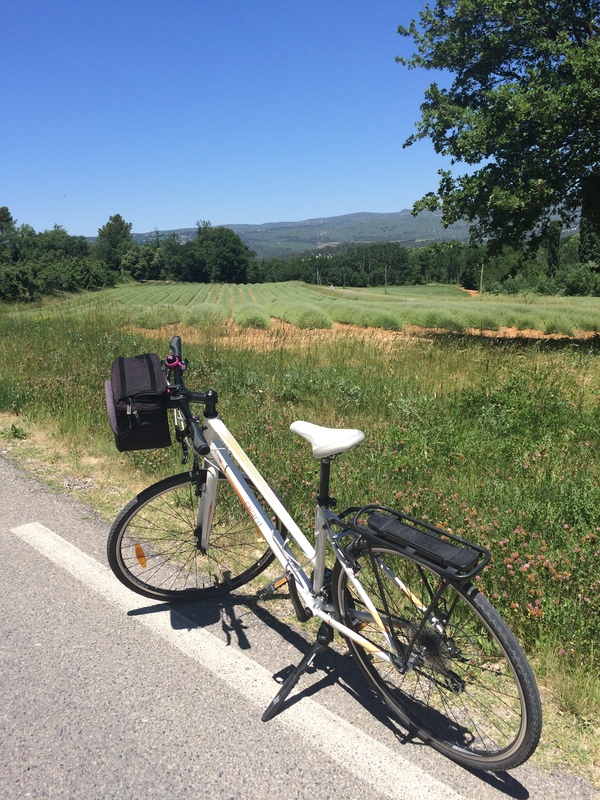 We have found we tend to notice more when we cycle and it certainly helps you get under the skin of an area, much more so that if you spend time just driving from place to place and it has to be said that the Luberon area caters for cyclists very well. 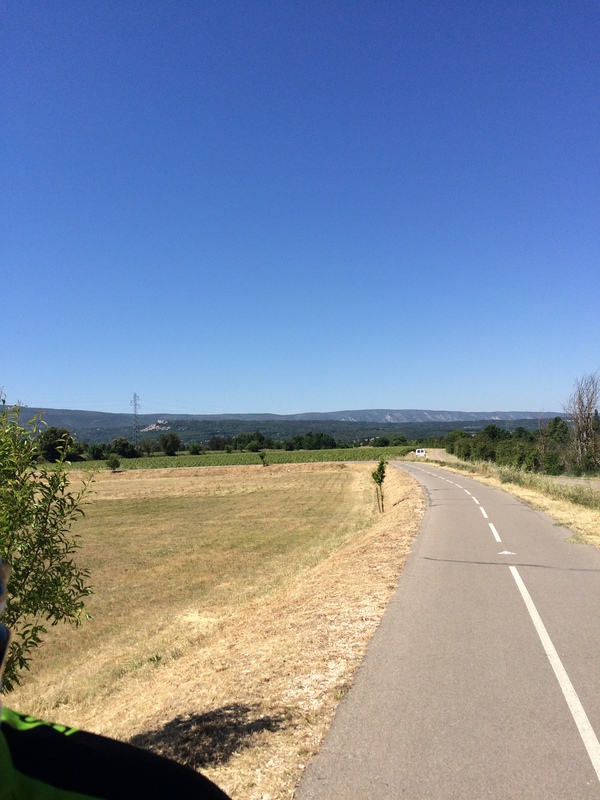 Today we started by cycling along the Veloroute Du Calavon from Robion to Pont St Julien – I can’t say enough about this route that has been laid along what appears to be an old railway line. 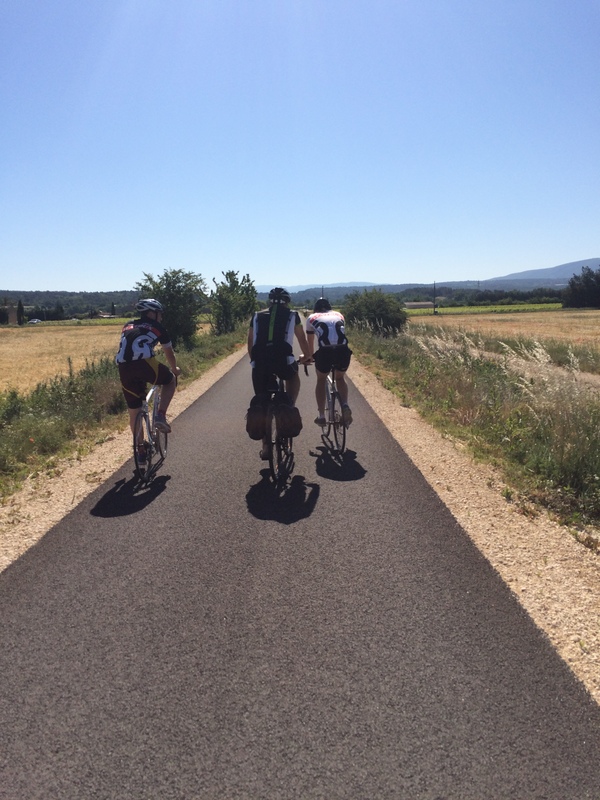 It gives cyclists a safe, traffic-free route through the Luberon Valley – sometimes it runs within sight of the main road and it is then that you really appreciate how uncomfortable it would be having to cycle on the road with the weight of traffic it now carrries. It also allows you to notice the little things, like a large snake slithering across in front of the bikes, when we disturbed it from its early morning rest and 2 small birds mocking a large Raptor that they clearly felt was threatening their nest. We stood and watched this battle for some time, admiring the bravery and tenacity of the 2 small birds that constantly came back to attack the larger one, which eventually made its way off across the fields and away from their territory. It is great to see that the Veloroute is being so well used, with a steady stream of cyclists, joggers and walkers heading along it. From Pont-St-Julien we made our way up the gentle climbing road to Roussillon with the boys streaking ahead and my hubby keeping me company at a ‘Driving Miss Daisy’ pace – Taking in the heady scent of the Broom & the wild herbs as we climbed (something that passes unappreciated when you simply drive up the same piece of road). We finally met the boys outside the Boulangerie and after parking the bikes headed off for a brief look in the galleries & then for a much needed lunch. The one gallery that we always visit when in Roussillon is that of Francoise Valenti http://www.francoisevalenti.com/index-GB.htm – her paintings are beautiful and really capture the Vaucluse area well. She is also a lovely character and speaks passionately about her paintings, telling you about the places she has painted and the people she has met along the way. Today she was chatting to us about a particularly stunning painting of the lavender fields between Sault & Mont Ventoux (after noticing the boys’ Ventoux cycle shirts) and was telling us that the clouds shown in the picture are known by the local farmers as ‘empty packages’ as they don’t bring any rain. One day I’m sure we’ll try to buy one of her works of art, but at the moment our commitments lie elsewhere. After lunch we headed on through the quiet lanes towards Gordes, noticing that the Lavender is just starting to show its distinctive purple flowers and seeing Hoopoes flying across the road and a bird with a ‘kingfisher-blue’ underwing tackling a small snake or lizard and flying off with it to a nearby field to really get to grips with it. The climb up into Gordes via what we call the ‘back-route’ is long and seems to be much steeper than the main route in past the Village Des Bories, but again the boys managed it easily (leaving me well behind). 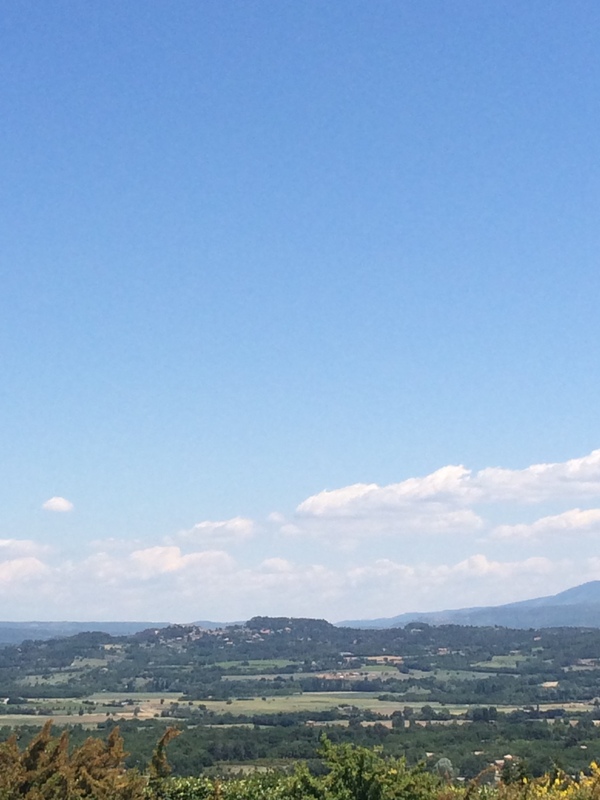 It tracks up past Olive Groves & cherry orchards and offers spectacular views across towards Roussillon and beyond – today there were lots of ‘empty-packages’ sitting above the hills in the distance. 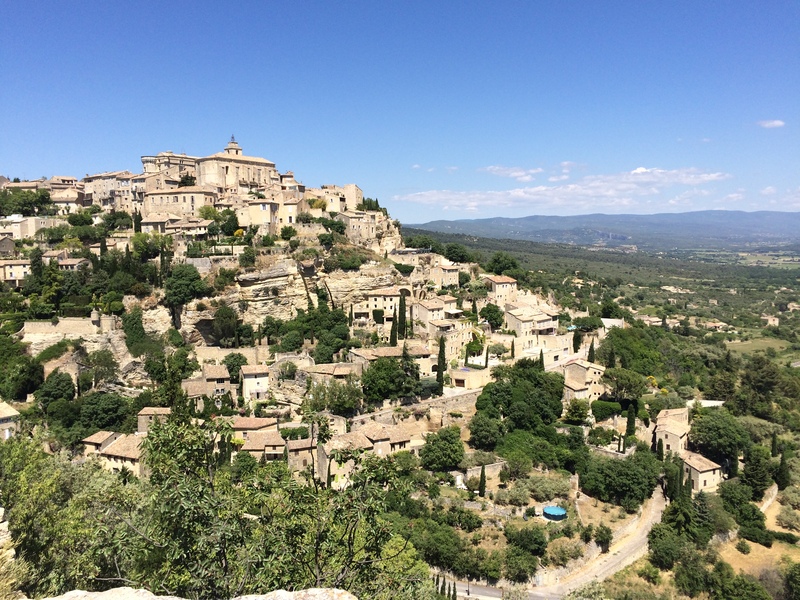 Gordes is always stunning, but cycling there always gives you a great sense of achievement, particularly today when I was cheered on with a cheerful ‘Allez! !’ by a couple of walkers as I entered the village. We know it so well now we find we don’t feel the need to just wander and take photos, so are able to just sit and watch the world pass by (today with an ice-cream from the Boulangerie). The last time I was in Gordes there was a young couple in full wedding attire taking photos of themselves around the village and today we watched as a man tried hard to withdraw cash from the Durex machine on the wall of the Pharmacy, all things we would probably miss if we felt we were on a mission to see the village, get the photos & move onto the next. 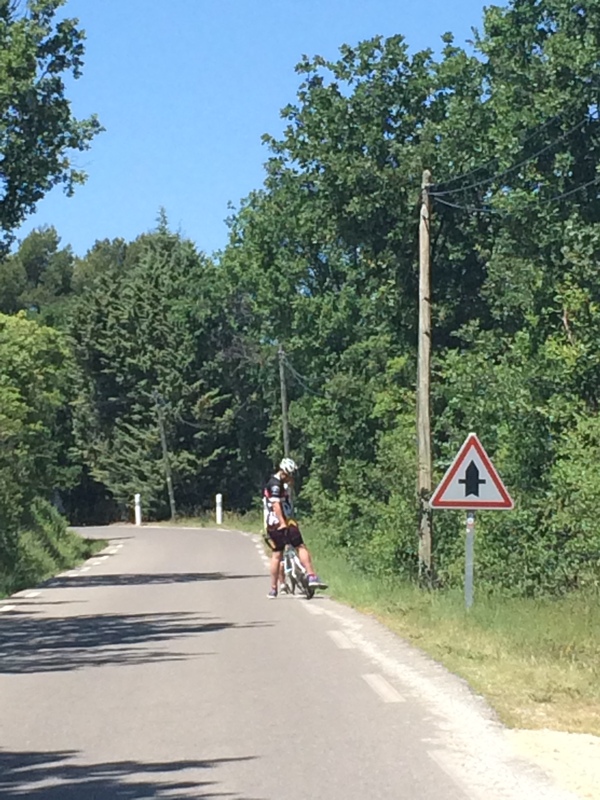 I know cycling isn’t for everyone, but we get so much from it as a family – we have watched the boys move from weaving dangerously on the camp-site, to cycling (with many stops) along quiet lanes, then onto cycling competently for a few miles, before last year taking on the ride and reaching the summit of Mont Ventoux. We’re not manic cyclists, but we all enjoy the process of getting somewhere, taking in those small things that you see, which would simply pass by un-noticed if we were in a car. 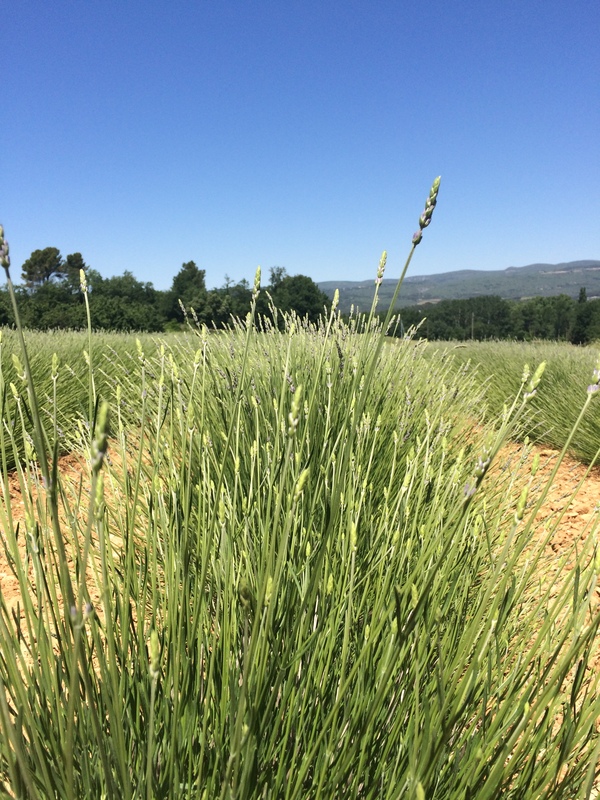 Previous Post Two Weeks in Provence – Day 11 – One of Mum’s 10 minute walks. Hi Stephanie – thank you so much for your lovely comments – I’m so pleased you have enjoyed reading the blog & I’m incredibly envious that you will soon have a house out here. We are certain that we will move out here one day and like you I spend hours just browsing estate agency web-sites and looking forward to our next holiday (Mid August – so just over 10 weeks- not that I’m counting!!) We know Saint-Saturnin well & it is certainly one of the villages that we would look for a house in.